Lots of wasp activity here and after two days of heavily overcast skies and very little activity it has brightened up and there are clouds of bees everywhere going to who knows where...not my garden flowers which I have an abundance and diversity of! Hi All, while the bees haven't built up spectacularly quickly they are still making steady progress. Wasps don't stand a chance of getting in the hive any that try are quickly ejected! They seem to prefer to wait for debris and old bees to be thrown out of the hive and provide a cleanup service. Taken a picture from the window you can see they have stored some honey that is now capped. Hopefully they will get enough for the winter. Drones are still flying in the afternoons and haven't been turfed out yet. I have also included some pictures of the window/access as requested earlier in the thread. Might have a quick look in again late September if weather permits. Hopefully the bees will have plenty of stores for the winter. Hi All, I took a video today at the hive entrance. A bee from another colony is looking for a free lunch. However despite his persistence the colony easily stops him in his tracks. So far it has been the same with wasps not being able to get in. Hi all, the Ivy is starting to flower and the bees have increased activity significantly. I was beginning to worry about them. Drones are still about going out for mating flights. But lots more worker activity bright yellow pollen coming in and nectar presumably as most bees not carrying anything in. Included a video from today around lunchtime to show activity. How are other peoples bees doing? Our KTBHs are very busy at the moment more so than the Perone. Unfortunately the Perone colony has failed to survive the winter. Not 100% sure why but feel the queen may not have been mated properly or old and not replaced. There were some stores left but probably not enough numbers to keep going. The buildup in the summer wasn't quite as fast as expected. Now there is an enormous bait hive ready for spring. It will be interesting to see if a swarm moves in. On the plus side 4 from 4 untreated and unfed HTBH colonies (with the new Chandler deep wood chip floor) sailed through the winter and are going great guns. Very busy bringing in great big balls of pollen. My condolences. Keep up the good work. Better luck next time. Anyone else in the UK still got one going? Not yet, One has been built for me and is awaiting a swarm. I think we are still on track for an early season. - My bets here are somewhere around mid-april. Have a nuc that survived the winter full of aggressive bees - could not do anything with them. Took the opportunity to do a quick transfer to the Perone hive last week, fastening the frames with zip ties. Closed up quickly! They are now very calm and bringing in a lot of pollen. For the first time with these bees, I have been able to stand by the hive and just watch. Makes a change from being head butted, chased around the field and being stung through the suit. I know a swarm is ideal but this was the 'last chance saloon' for this colony apart from re queening. They are now very calm and bringing in a lot of pollen. For the first time with these bees, I have been able to stand by the hive and just watch. I have to remember this one, it's better than requeening or destroying. I still wouldn't put one on the allotment though as it would not be easy to sort out should they get stroppy. Hi All, just wondering about your thoughts on the Perone mk2 this year. Last year I populated it with a random swarm I collected unfortunately they didn't build up that well possibly due to an old past it queen or a poorly mated one and they didn't make it through the winter. I started the hive at the full size i.e with the 3 supers on top. The bees built comb on one side of the brood box and into the two honey supers above not building any in the third super. This year I'm planning to populate from one of the prime swarms from one of my KTBH so as to be sure of the bees i.e prime swarm age of queen known, proven survival untreated etc. Just wondering whether to stick with the full size plan or to reduce to just the brood chamber or some other combination. I'm leaning towards brood chamber + 1 super. This video on youtube http://www.youtube.com/watch?v=1VpO0C-Nt6M shows a swarm building up but they don't have any supers on top of the brood chamber. I'm planning to leave the comb that was built in the brood section last season wondering your thoughts on this and whether to clean out any comb left in the honey supers. I thought if I cleared the honey supers it may encourage the brood-nest to be in the big brood box area. Any thoughts / ideas appreciated. hi. just wanted to drop by real quick and give a brief update on my Perone hives. of the six populated last year, only two made it through the winter, but they're both doing very well. I've just re-populated the one that's at my home with a very large swarm. the brood chamber was about half full of comb from the previous colony that didn't survive the winter. so, from my point of view, the jury's still out. I'm optimistic, and plan to start populate several more this year, but I certainly can't say the design definitely works here. Glad to hear your survivors are doing well Tel. I have repopulated my Perone MK2 with a swarm from a colony in a church wall. It was on Sunday the 11th. Although I couldn't be sure whether it was a prime or not. I thought as it was pretty early on in the season and none of my KTBHs had swarmed yet chances were it was a prime. It wasn't the biggest swarm in the world but they were tightly clustered as it was a cold wind. I setup the hive with the brood chamber and one super with the comb left over from the former colony. We shook the swarm out onto a ramp up to the hive entrance and it didn't take long for the first bees to go inside and then tell the swarm to follow them in. We saw the queen walk up the ramp over the bees and into the entrance then the remaining bees quickly followed. It looked as though she was mated but couldn't be 100% sure. There weren't many drones in the swarm probably 3 or 4 that we saw. May the 12th (next day) No activity in the morning have they already left? But there was still a faint humming coming from inside. Then in the afternoon they got quite busy doing orientation flights and foraging. Although no pollen going in yet. May 13th Similar to 12th but a lot busier. outside temperature hotter. May 16th 1130 pollen seen entering the Perone great sign on day 5/6. Possible indication of eggs hatching and larvae needing bee bread. Bees working well very busy foraging mainly nectar. Hopefully if all goes well the queen will be laying and the population after falling slightly will begin to build up in June as the brood hatches out. Summer 2014 both Perone hives built up well and thrived. One of the hives started to go a bit quiet going into late summer / autumn probably swarmed or failing queen. The second hive was populated with a swarm and also built up well. During really hot days one of the hives was overheating and the bees were bearding and then swarmed shortly after. I was running the hives with just the brood chamber and the bottom entrance as per the plans/videos online. 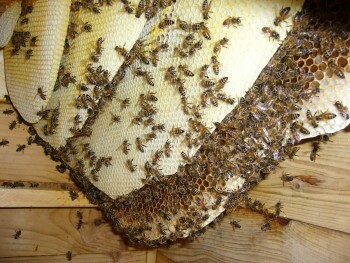 The bees in both hives built out comb filling about half of the brood chamber. They were left alone and made it through the winter. Unfortunately both hives ran out of stores at the beginning of March 2016 before any flow started. This was not good however looking into the hives after was interesting the combs were enormous but minimal stores were left. On one of the hives it was interesting because instead of propolising the cracks in the wood shut between the planks it look like the bees were trying to chew it into an entrance possibly or maybe to get some more ventilation. 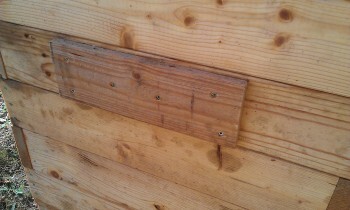 Spring 2016 Anyway from this I decided to try to stop the over possible heating/possible lack of ventilation by drilling 2 25mm diameter holes about 7cm down from the top of the brood box on the same face as the bottom entrance. I have also covered the outside of the hives with some expanded polystyrene which will hopefully insulate the bees more from the beating sun and the cold of winter while they are still filling the brood boxes up to capacity. I baited the hives with some swarm lures and also left all the comb that was made by the previous tenants. A few days ago there were a few bees looking at the hives some were dark and some were more yellowy. It was odd because they were having dog fights and fighting over the entrance to the hive (new top entrances) Then a day later there were between 20 and 40 bees buzzing round the Perone. This morning again lots of activity then after lunch I think a swarm must have moved in and the Dark bees have taken up camp which is very exciting. (never successfully baited a hive before). However the second hive is also seeing a fair amount of activity probably about 10 or so bees inspecting going in wandering around then coming out also similar dog fights and dragging different colour bees out onto the ground. Fingers crossed for another move in. It's a lot easier than scaling a tree with a ladder that doesn't quite reach and a skep only for the bees to have absconded when you go back at dusk to pick them up! I think I will leave the perone route for a while longer. It seems here in the brim north (or least my small piece of it) that small colonies seems to fair better over winter than the large ones. Until I successfully get a large colony through winter I going to stick with kTBHs. In terms of over-heating further insulation (rather than ventilation) would help with that as well. For the last 2 days the bees have started taking pollen into the hive which is a great sign. Hopefully there now are some eggs inside and a good laying queen filling up the empty combs with eggs. 2nd Perone hive still getting lots of attention usually about 20-40 bees buzzing round in and out of the entrance at the hottest part of the day. Hoping for some good weather and a swarm to move in soon. Fingers crossed. Have you considered putting a tree/shrub near the hive in order to provide shade? I believe that Perone recommended placing the hive behind a deciduous tree so as to provide shade in the summer and enough light/warmth in the winter. Hi all pleased to report a swarm has moved into the 2nd empty Perone yesterday. Never had a successful bait hive then 2 in 2 weeks amazing. Wintering yes the hives are partially shaded by the trees/shrubs near by and will get more shelter as the plants grow luckily. Thanks for your suggestion. Glad to hear this! Perone recommended adding the hole at the top of the brood box with the logic that the bees will have less distance to travel from outside the hive into the active portion of the colony (near the top bars). As the hive grows, he reasoned, they would use the bottom hole more often due to the fact that the comb is much longer and closer to the floor. Hive one going well pollen going in, it was interesting because the bees closed up the top 2 25mm holes to about 10mm diameter holes. for a week but now they have re opened the holes. It may have been for the cold weather we had. But they are starting to get busier. I expect some of the new bees are hatching out by now and the hive should get busier. The bees mainly use the top entrances and basicly ignore the bottom one. Hive two. This hive is busy I think the swarm that entered was bigger than in Hive one. They use the top entrances for most traffic but they have an air conditioning detail of about 10 bees fanning air out of the bottom entrance. They are very busy at the moment and taking in lots of nectar and pollen. In other news we had a swarm yesterday which we have housed in a KTBH and we managed to take a few bars of comb from another KTBH for honey. Which was a bonus. Off to check out the girls now. July Update, Both the Perone colonies are really busy at the moment plenty of pollen coming in. They both use the top 2 25mm holes for going in and out foraging. Then the bottom 9mmx50mm slot entrance at the bottom is used by a air conditioning team of bees usually numbering between 15 and 30 bees. We opened up the back of the hive on colony 1 and to our suprise they had replaced almost all the old comb from the former colony and replaced it with fresh white wax. Before they moved in the old nest took up about 2/3 of the brood area. They have replaced about 2/3 of this with new wax. The Hive was very full of bees all the combs were covered. Also you could see the bees getting rid of the old comb and replacing it with new comb as they went. sort of a bit at a time rather than tearing the whole lot down and starting a fresh. Colony 2 was also packed with bees and has a similar nest size within the brood box. However they still have a lot of the old wax. It is possible they are replacing it from the inside out and haven't made their way to the bottom of the combs yet. They also had some fresh white comb built towards the sides of the old nest. Fascinating stuff. High hopes with the new modifications of top entrances, more insulation and the early swarm arrival date of the bees sailing through the coming winter. May is here and despite the cold weather the bees in 7 out of 8 hives made it through the winter. The 2 full size perone mk2 hives both made it through and are busy gathering pollen and nectar. They have been occupying the brood boxes since they swarmed in last year. However this could be the year to try a super on top as they are pretty well established. We have taken our first swarm today even though it wasn't that hot today and have put it into a new hive tonight. The operation went well. Will update soon. Please feel free to ask any questions about our experience with Perone hives or KTBHs or bees in general. Good luck with it. Keep us posted. Unfortunately, life still has not come up with a Perone site yet but I came to Sussex with one hive and now am up to nine. Having a go with Warre this year as well. next swarm will get me started. Up to 9 hives Andy nice one must bee keeping you busy in Sussex. A touch of strimming in and around the apiary today. Bee's very busy overall in the hot weather. Perone MK2 with two supers on very busy hoping for a harvest at the end of the summer! 2nd Perone MK2 with no supers has perked up a bit now starting to get busier. Mini Perone/national dimension brood cube with one super has quietened down since late spring probably swarmed out and looking to build up. Will have a look in the top to see if they have started building anything. 2nd Mini Perone/national dimension hive with no supers which a swarm was put into in May hasn't built up as hoped however they are still flying in and out so hopefully the queen just took her time to start laying! Luckily all the bees are of a friendly disposition and didn't mind the strimmer! Welll.....it is 13 hives now...the 4 Warre I got from Icko all have bees. I have one empty hive left. All swarms came to me! Wow supering your Perone, so what do you think of the system? Still too early to tell? My problem here in the south is what I perceive to be higher levels of disease. We have a nice bee inspector though and tightening up on the hygiene side of things is no bad thing...just in case. There is a bit of EFB between my two apiaries which are 15 miles apart. It would be great to have update on your experiences with Perone Hives.